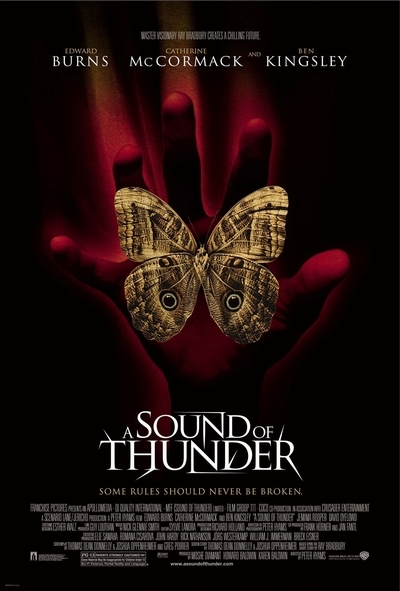 Story: Based on a short story by master of science fiction Ray Bradbury, the sci-fi action adventure A Sound of Thunder is set in the future, when time travel is not only possible... it's a lucrative monopoly. It?s especially profitable for Charles Hatton (Ben Kingsley), the owner of Time Safari Inc., a travel agency that specializes in escorting wealthy clients on exclusive hunting trips back to the Prehistoric Age. When an expedition is compromised and alters the landscape of the future, a seasoned scout (Edward Burns) teams up with the inventor of the time travel technology (Catherine McCormack) to unravel the mystery behind the catastrophic historical changes that are threatening to erase humanity from existence.